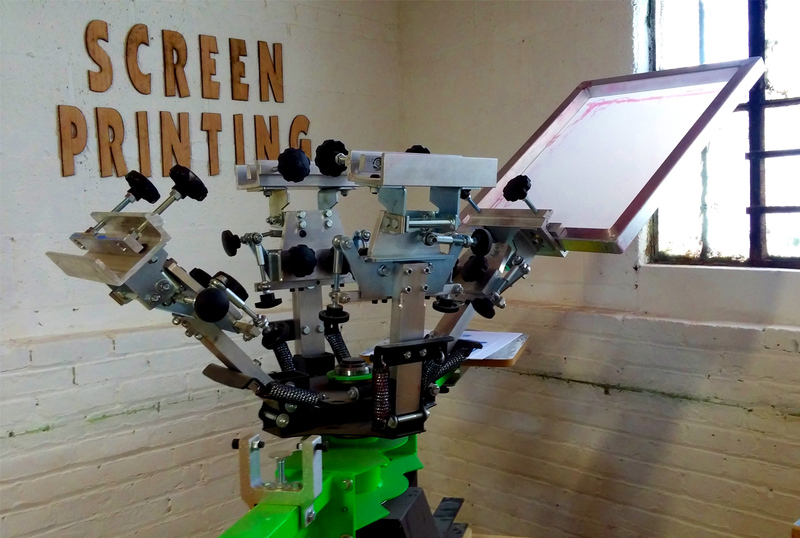 We have a four color two station screen printing press. We keep supplies and materials in stock for printing with plastisol and water based inks onto t-shirts, tote bags, and posters. The vinyl cutter offers another method for making screens. Below are step-by-step instructions, but we recommend watching a few videos to see the process as well. - Use scoop coater to apply a thin, even coat of emulsion to a clean, blank screen in a dark place. Let dry (3-6 hours) in the dark. - Meanwhile, prepare design by printing a mirror image onto a clear transparency sheet (use ink jet printer). - Tape transparency to screen, taking care to center your work, and lay print-side down onto exposure table. Expose for 5 1/2 minutes. - Wash screen out using garden hose attachment under utility sink (take screen outside garage door to rinse). - Weed vinyl and then apply carefully to screen. Your screen is now your "negative"
- Tape around any exposed edges between your design and the edge of the screen. Painters tape or masking tape work well. - Water based ink can air dry (a dryer will speed this along). Plastisol inks need to be cured to ~330 degrees F. There is a flash curer and heat guns available. Be sure not to burn your printed item or melt the ink by over-curing.